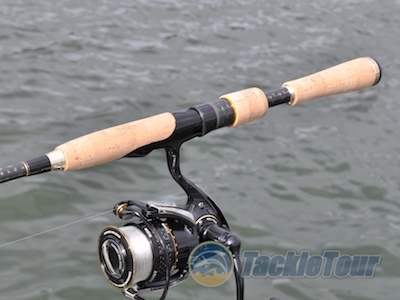 Introduction: Earlier this year, we shared with you our more than positive experience with Evergreen International’s TKLS-64LX Alley-Oop spinning rod on its way to earning our Ultimate Enthusiast Award. The only real downside we could find in that stick was its inherent price thanks to a poor exchange rate. Otherwise, the Alley-Oop was all we could ask for in a light powered spinning stick. While that stick is part of Evergreen International’s top end bass series, there exists another line of rods that share similar features to the Kaleido sticks but at a slightly more palatable price point. 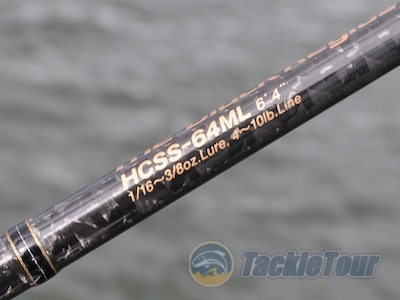 The Heracles sticks are Evergreen’s tuned versions of their Tactics rods and every bit as powerful and sensitive as the Kaleido at about two thirds the price. We got our hands on a HCSS-64ML Black Regius for “What the Finesse” and here’s how it all turned out. Introducing Evergreen International's HCSS-64L Black Regius. Lure Wt. 1/16 - 3/8 oz. Impressions: The difference between Evergreen International's Kaleido and Heracles series of rods is quite obvious when you're comparing the casting sticks. Immediately you see that one features cork handles (Kaleido) while the other features foam grips (Heracles). With the spinning sticks, this distinction is not as cut and dry, in fact, the HCSS-64ML Black Regius is hardly distinguishable from the higher end Kaleido cosmetically, but how about performance? 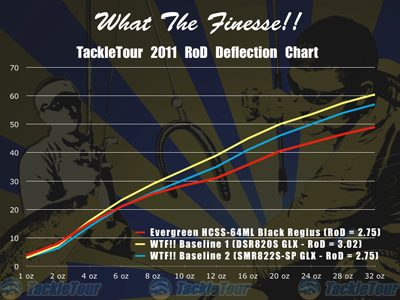 Fig 1 : This chart demonstrates the deflection characteristics of the Black Regius (red curve) as compared to that of our two WTF baseline sticks. As you can see, the Black Regius ahs a fairly soft tip, but then stiffens up as more load is applied. Lab Tests: Of course, first stop for the Black Regius before hitting the water was in our lap and an appointment with the RoD WRACK. As it turns out, the HCSS-64ML has a similar, light tip to our previously reviewed Alley-Oop, but given it’s a “medium light” stick instead of just “light”, the Black Regius has considerably more power than the TKLS-64LX even with the LX’s “extra fast” taper. At 3.3 ounces, the Black Regius is actually lighter than the Alley-Oop although it’s balance point is out half an inch further than that of the Alley-Oop as well (6.5” vs the Alley-Oop’s 6”). Balancing torque numbers are very close with both rods rounding up to 0.11 ftlbs of balancing torque. The Black Regius is classified as a medium light stick and fishes very true to this rating with a nice, soft tip, but a good deal of backbone. 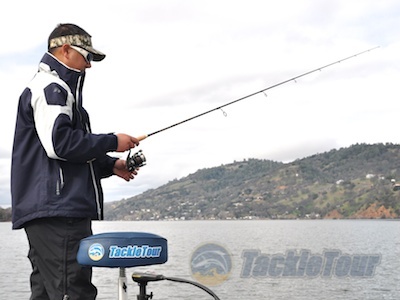 Field Tests: We took to Clear Lake, California with this stick for some early season finesse fishing where I matched it up with my Daiwa Exist More than Branzino 2508 spooled with Toray Super Finesse fluorocarbon at five pound test. Drop shotting at 20 feet out on Clear Lake, CA. Casting: Back in May, we praised the casting ability of the Black Regius’s cousin’, the Alley-Oop which is a stick benefitting from an extra-fast taper. Light powered sticks with extra-fast tapers are characterized with superb accuracy in casting situations. 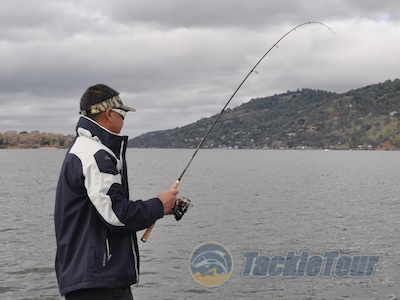 This is especially evident with spinning rods where accuracy is more difficult to achieve. The Black Regius has a standard, fast taper and therefore does not share the same pin-point casting accuracy as the Alley-Oop, but that�s not to say this stick is a slouch either, far from it. Detailing on this rod is not very different from the Kaleido series. If you make a habit out of feathering your casts, you can still achieve very accurate casts with this stick. 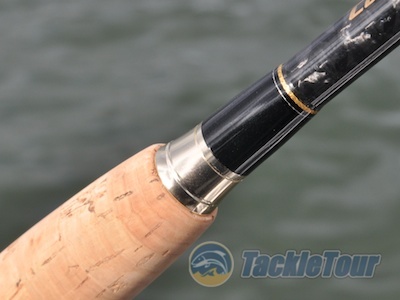 The Black Regius loads easily as any “medium-light” spinning stick should, and thanks to this stick’s six foot four inch length, it’s still relatively easy to keep casts at a low trajectory. Because this stick is a power up from the Alley-Oop, it’s a much better candidate for skipping baits under docks. The Black Regius features a fast taper and as you can see in this photo, it sets up very quickly. Next Section: Finesse and Power?